In partnership with the gaming industry, the Florida Council on Compulsive Gambling, Inc. has created the Gold Standard Responsible Gaming Player Protection Certification Program to recognize facilities that provide environments which promote responsible gaming practices and protect patrons who demonstrate signs of problem or compulsive gambling. Participation in this program is not mandatory or required by the Department of Business and Professional Regulation (DBPR). 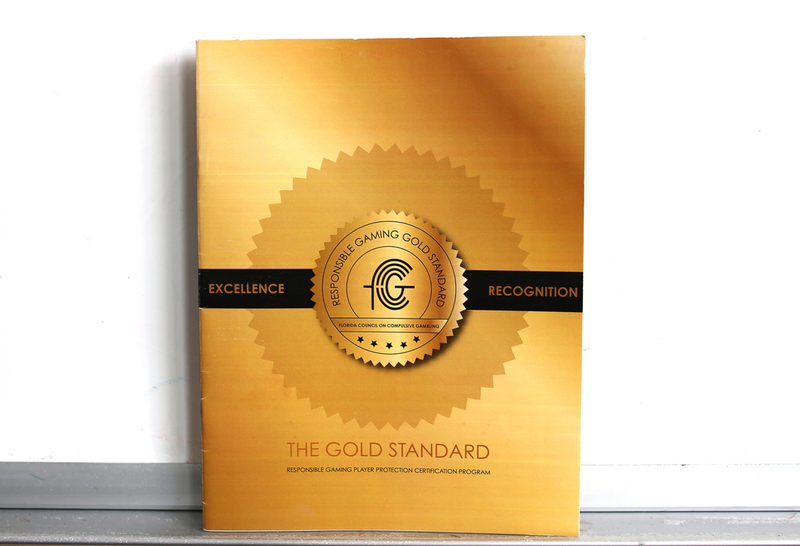 The Gold Standard Program is designed to recognize industry members who choose to demonstrate a higher level of commitment to the industry, staff, patrons and community than required by regulation. What is the Gold Standard Certification? Once certified, the facility maintains a system that ensures ongoing vigilance in responsible gaming player protection practices for annual review and renewal of certification. Note: The information supplied by applicants always remains confidential. Any gaming facility operating legally in the state of Florida may apply for and request Gold Standard Certification. While the process may focus most heavily on gaming facilities offering slot machine play, or pari-mutuel facilities that have electronic gaming machines, it is strongly encouraged that any organizations offering any form of gambling apply. Poker rooms and pari-mutuel facilities are eligible and encouraged to apply and participate in the Gold Standard program. What is the basis for the Criteria? Criteria for the Gold Standard are based upon effective practices for responsible gaming and player protection. These criteria represent the work of experts representing gaming facilities, legislature, compulsive gambling programs and researcher. How do facilities benefit from Gold Standard Certification? The Gold Standard certification can be used to demonstrate to regulatory bodies, potential employees or customers, the commitment of the organization to this important element of facility operation. What public recognition does a Gold Standard facility receive? A Gold Standard facility will receive a wall plaque/certificate for display, as well as emblems which can be placed at each entrance and exit. Facilities may publicize and advertise their receipt of the certification. Gold Standard facilities will be recognized on the FCCG website. What is expected of Gold Standard Certification recipients? Recipients are expected to maintain the high level of performance excellence that was demonstrated at the time of their application for responsible gaming and player protection. Certification is for a period of 1 year and recipients will receive site visits by the certifying program or program representatives during the 12 month period. Are there any fees to participate in the Gold Standard Certification process? There is a required application fee that covers the cost of the application review, site visits, certification materials, technical assistance, and the annually required training of all staff, conducted by the FCCG.